Here is a piece I wrote for the Xpress website about CHIVA, an innovative organization that is holding an event this Saturday evening. We are trying to contribute to the inclusion process of the new face of WNC,” says Carolina McCready of the CHIVA – Transporting Opportunities to People (TOP) Project, a social entrepreneurial endeavor that she helped to start a year ago with Sarah Nuñez and Victor Palomino. 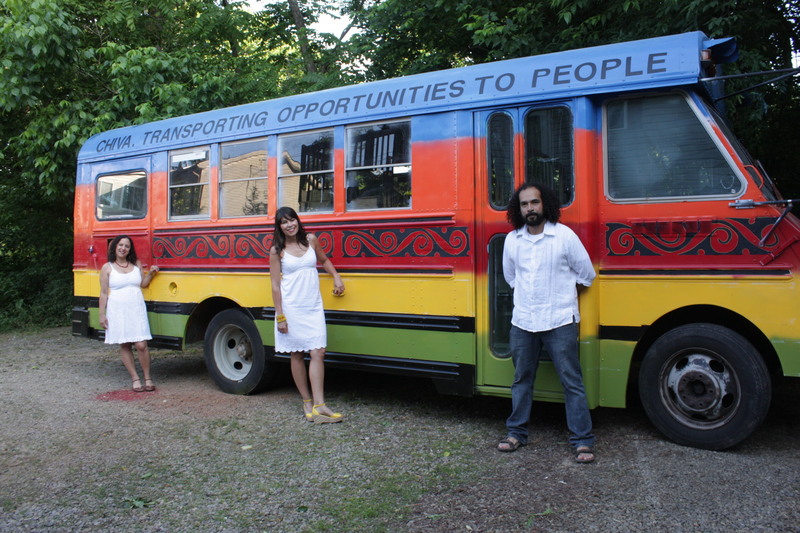 Specifically, the CHIVA is a school bus that has been turned into a mobile outreach space. The CHIVA TOP Project is designed to deliver on the spot services, educational opportunities, resources and multicultural activities to communities in Western North Carolina, with a particular focus on Latino communities. McCready, Nuñez and Palomino have been collaborating on Latino community organizing projects for almost ten years. With CHIVA, says McCready, the group wanted to reach out to Latino communities in a different way. “Knowing that transportation is a huge barrier, we did not want to wait for residents to come to community centers and art events, but instead decided to create a vehicle to transport opportunities to their neighborhoods and deliver workshops and information,” she adds. McCready says that during 2013, in addition to getting the bus up and running, the group mobilized youth at UNCA with the Me2We conference, visited a Latino neighborhood, and collaborated with the Mexican Consulate visit to WNC. On Saturday, Dec. 14 from 6 to 9 p.m. at the Asheville Area Arts Council, 346 Depot St., CHIVA will be showing videos of work they did in 2013. The group will also be seeking input on their direction for 2014. There is no charge to attend the drop-in event and light refreshments will be provided. Find out more at chivatop.com.